You are born to lead. It is in your genetic makeup. 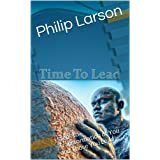 Study over 54 world leaders from workplace, community, government, church, education, and home that changed their world. Tell me when it is in print…fill out response form below.